I really believe that every part of your wedding needs to be special. Every aspect is a way to be sentimental and stand out. I mean, you only get one chance at everything. There are no redos. So why not go all out? That's how I feel about asking your friends to be in your bridal party. Oh sure, you can just ask them casually ... or you can be inspired and do something special that they will really remember. That's exactly what my Twitter friend Lydia did. 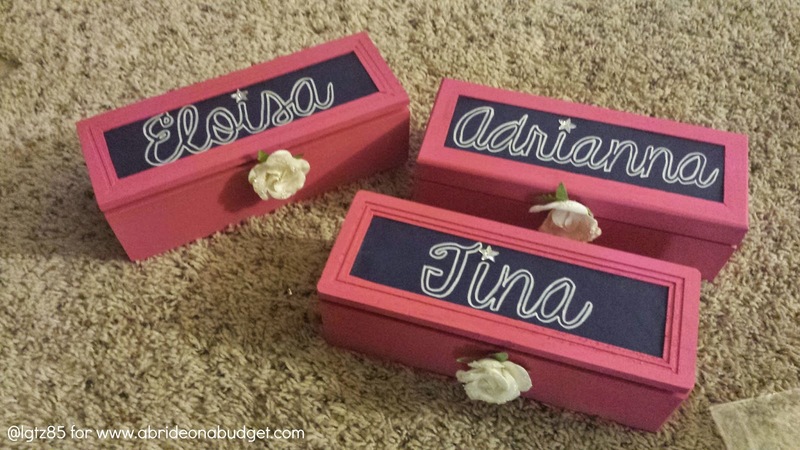 She asked her girls first, then she presented them with these beautiful bridesmaids boxes. I'm in love with them. Remove the little clasps on the box and fill the holes with glue. The font is called KG Eyes Wide Open and I downloaded that for free from dafont.com I changed it a little in Photoshop white color then added a thick stroke so it would be an outline, printed that out, and then on the backside of the paper, shaded it with pencil, then traced it onto the scrapbook paper (this is the best and easiest way to do this and get awesome font styles!) The inside, I kept it in its regular style. Then outlined with the marker, I love that it kind of looks like a chalkboard, my cousin actually thought it was! 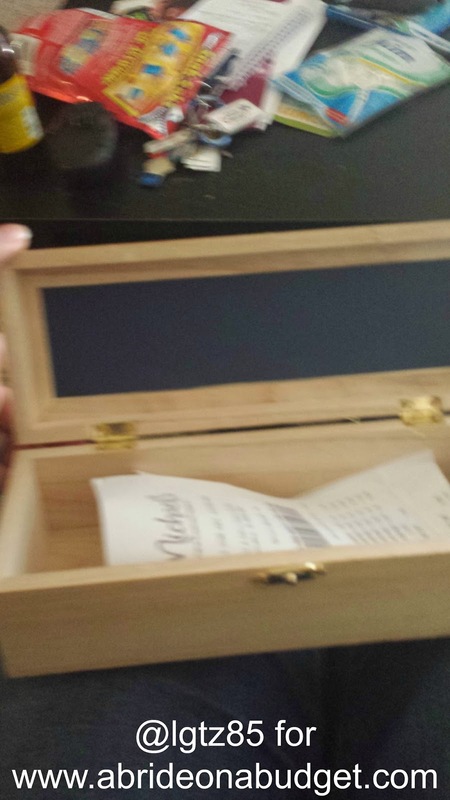 I was able to slide the scrapbook paper into the top part of the box and fit it under the wood; I did glue it just for extra measure. Tie the light up ring around the "diamond" with the ribbon, then glue the ribbon to the box. She even created the labels for the wine in the same font. The text up top says The Smith-Jones wedding (okay, no, it doesn't, but just pretend the bride and groom's last names are Smith and Jones and you get the idea). She put a small maraca image on both sides of the text because, if you remember, this is the same Lydia planned a Tex/Mex/Fiesta wedding (and the reason behind my Fiesta Wedding Inspiration Board). Her colors are navy, white, and pink, so it was great for her to incorporate her color scheme into these. They're really adorable. Imagine receiving one. Is there any way you could say no to being her bridesmaid? 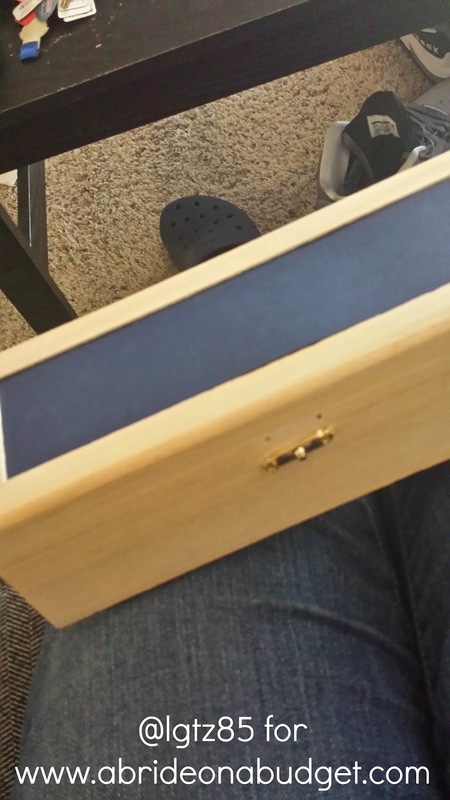 (Actually, she told me she had verbally asked them months before this, just to make sure they wanted and were able to be a part of her big day, and she gave them these beautiful boxes later as a surprise). 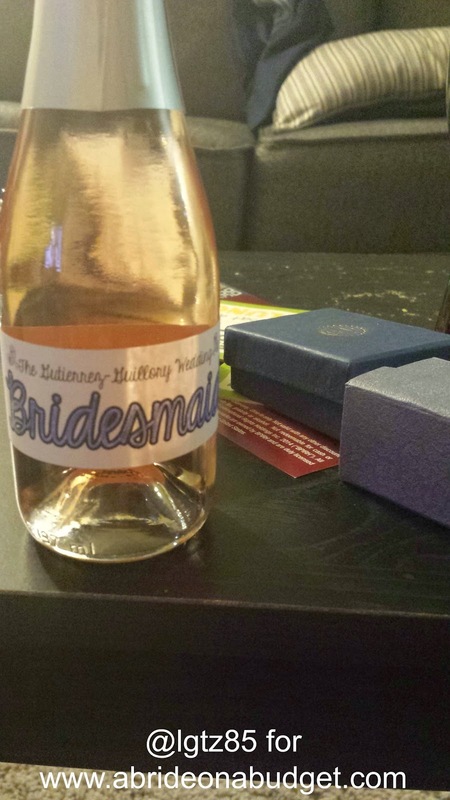 In case you're curious, I "proposed" to my bridesmaids when I asked them to be a part of our wedding party. You can see that in this post. Be sure to tweet Lydia at @lgtz85 and let her know you saw her amazing creations on A Bride On A Budget. 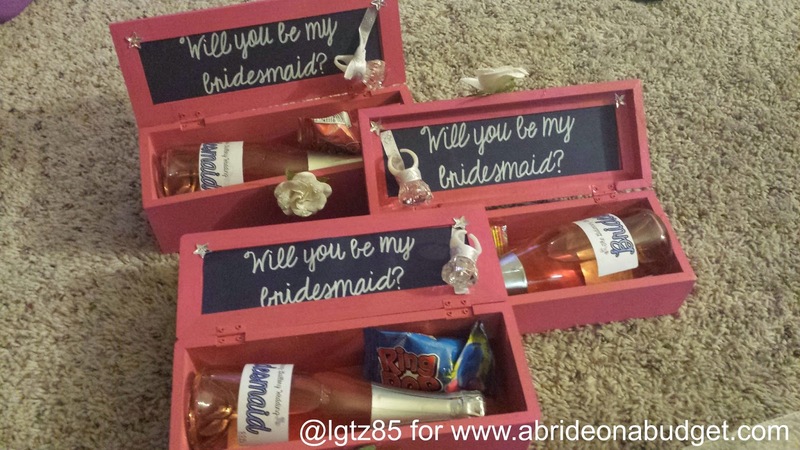 BRIDAL BABBLE: How did you ask your friends to be your bridesmaids? 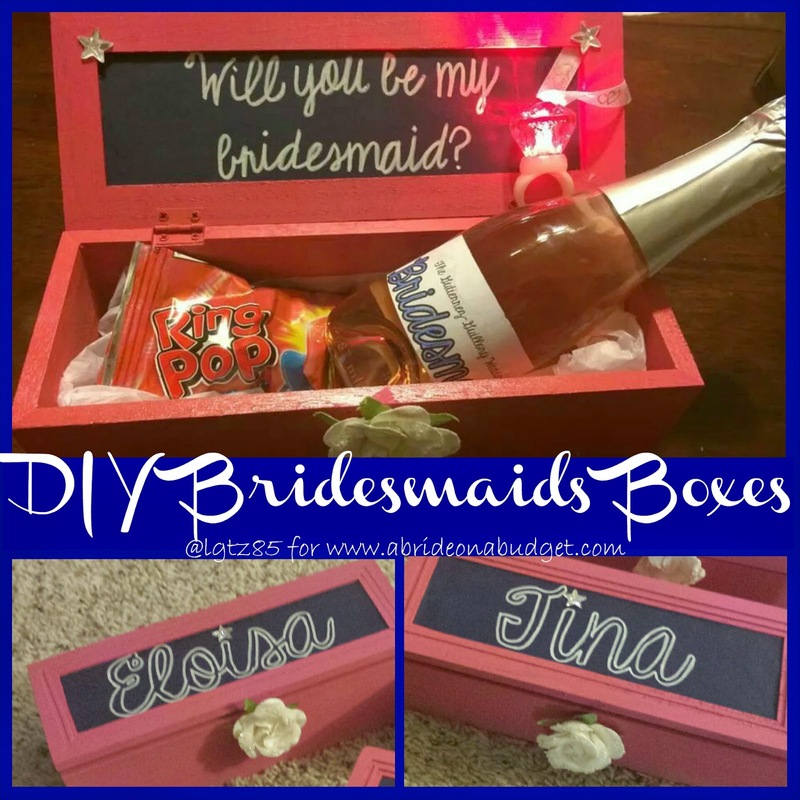 Need a bridesmaids thank you gift? 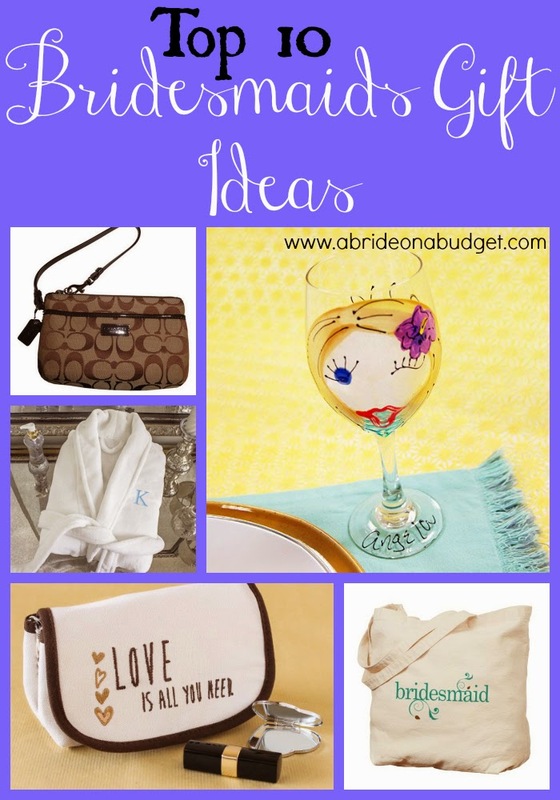 Check out our Top Ten Bridesmaids Gift Ideas post. Those are adorable!I love all of the great ideas you post! I don't remember! I just had my one best friend be maid of honor. These boxes are so pretty and fun! I love this idea! I These boxes would make such perfect keepsakes. I asked my sister and future sister in laws to be my bridesmaids by making special invitations with a rose included in each one and hand delivered them. That is a thoughtful, fun gift for bridesmaids. These are a super cute idea, love it! I like that you can personalize each one. I love these boxes.You could make boxes like these for easter or someone's birthday,too. I likr this. Great idea. Thank you very much. What a great idea! Never thought of using boxes! I would like to invite you to attend our weekly #PureBlogLove Recipe and DIY craft party this week. Runs 8pm Thursdays-Sunday at midnight EST on www.themcallumsshamrockpatch.com. I hope to see you there! I adore your blog!